"This is the story of Ellie, the dog with the loving heart, who was rescued from a life of scavenging for food on the streets of Auckland. Now she has a forever home and her life is full of adventure and joy. The stories are told as if Ellie is writing them, She loves all dogs an... read full description below. Have you ever wondered what happens to an abandoned dog once she finds a new home? This is the story of Ellie, the dog with the loving heart, who was rescued from a life of scavenging for food on the streets of Auckland. Now she has a forever home and her life is full of adventure and joy. The stories are told as if Ellie is writing them. She loves all dogs and all people. We hope that her story will inspire more people to give rescued dogs a forever home. Dog lovers, both adult and children, will love the stories and the many evocative photographs scattered throughout. All profits from the sale of this book will go to Humane Society of NZ Inc to support their work in finding homes for rescued dogs. Author Jean Silver has adopted cats and dogs for much of her adult life. Her background in education included helping teachers to use movement to develop children's language abilities and skills. She believes this book will also be a useful tool in schools, helping to encourage animal-loving school children who are not avid readers to write and share stories about their own pets. Now retired, Jean writes poetry. 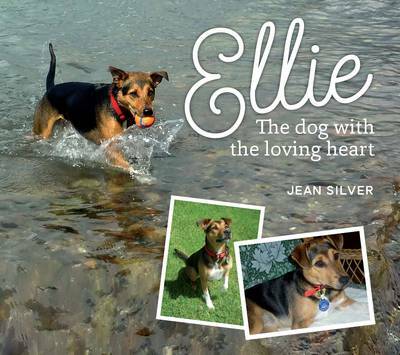 Ellie: The Dog with the Loving Heart is her first book.